It should come as no surprise to anyone who has known me for very long or who follows me on social media but, despite having read nine of her books, I actually don’t like Margaret Atwood’s work very much.1 I continue to read her books mostly out of a sense of professional obligation. I am therefore both pleased and surprised to report that I found The Handmaid’s Tale to be absolutely riveting. 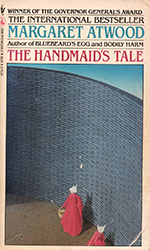 There are some books—and I usually try to avoid making statements like this, because most of the time they’re bullshit2—that have an ineffable quality that separates them from other books; they are in some way the real deal, and The Handmaid’s Tale is one of them. I don’t know that I would have felt that way if I’d read it earlier. Certainly my point of view has changed as I’ve gotten older,3 but since November the world has taken a giant step backwards. What might have seen absurdly far-fetched to me years ago seems dangerously close today. I can’t say for sure that this will make me pick up more of Atwood’s fiction for reasons beyond professional obligation—as I said above, all the structural and technical issues that cause me to dislike her work are all present in The Handmaid’s Tale5—but I wouldn’t say it’s impossible. At least, not her fiction. I do tend to enjoy her non-fiction. Not something that’s worth getting into here. Basically I mean that we, and men in particular, are finally starting to listen to the women who have been saying for generations that we need to not be such assholes to them. Except for the stuff in Lady Oracle that was borderline racist. None of that here.